Sunday we went to Trinity St. Paul’s (TSP) for church. There was a special service as part of the International Bach Festival that was hosted by the University of Toronto. There was a small orchestra, an augmented choir and professional soloists performing a Bach cantata. We service was at TSP, but held jointly with a German-speaking Lutheran church, a Jewish synagogue, and the church that shares our building. Most of the service was in English, but Hebrew and German were also incorporated. The church was almost filled (about 1500 people). After church we went back to the National for lunch and contacted a highly recommended diesel mechanic. We were concerned with low oil pressure. On Monday, the mechanic inspected our engine and found some stickiness in the manifold between the oil cooler and the engine block, thought there may be a partial blockage, and blew into it. This seems to have corrected the problem of low oil pressure. He also did an assessment on the engine, and said it was in good shape (in other words, we do not need to replace the engine yet). Tuesday we bottled a new kettle of beer. 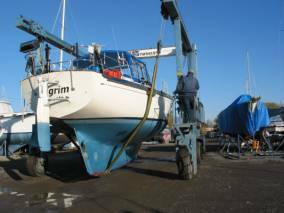 In the afternoon we made arrangements with the Whitby Marina for hauling out Pilgrim on October 27 to make adjustments to the Variprop and then replace it with the fixed prop so we can do some tests to see which prop will stay on the boat next year. Then, we will take down the masts haul out for the season on October 31. We also met with Alex Magnone who will do the work on Pilgrim over the winter. He was a carpenter at Whitby Boat Works when our boat was built, knows Whitbys very well, and bought the plant site when Whitby Boat Works went out of business. He showed us a boat he had just bought as salvage from an insurance company. We had heard earlier that a Whitby 42 had been hit by lightening in Kingston and was a total write-off. Alex bought it and was in the process of stripping it. It was horrific for us to see this boat. We suspect that the lightning hit the main mast and then traveled down the triatic stay to the mizzen because so much fire damage happened in the cockpit and cabin. There was no evidence we could see of any hull damage. The cabin was a charred ruin. The mizzen mast was not recovered. The wheel was badly heat-damaged. Evidently the owners of the stricken Whitby were on board when the accident occurred and were lucky to get off the boat without being hurt. The fire department was on the scene very quickly. Had the boat been in a wilderness anchorage, it would have been totally destroyed. 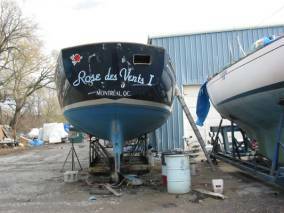 Rose des Vents was hit by lightening and burned within minutes just inside Confederation Basin in Kingston. Pilgrim now has some salvaged parts. 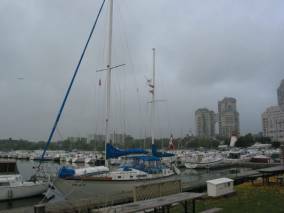 We left Toronto this morning at 10:00 with a strong East wind (10-15 knots) and 3 foot seas from the Southeast to make the short trip from the National Yacht Club to the Mimico Cruising Club in the west end of Toronto. We just met with our sailmaker (Quantum Sails) because we need modifications made to our main sailcover. 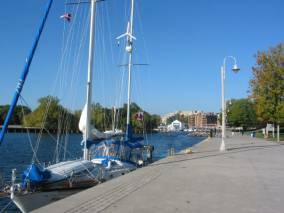 Since his sail loft is in the west end of Toronto, and we felt we had out-stayed our welcome at the National, we sailed here with just the mizzen and Genoa, managing a steady 6.5 knots all the way. Lake Ontario calm conditions on the way to Mimico Cruising Club. 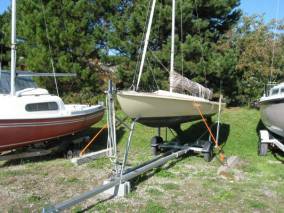 All of the masts have been removed so that the boats could be hauled out on the weekend. 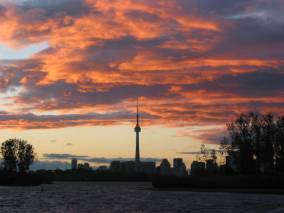 After we docked at the Mimico Cruising Club on Wednesday, the wind freshened from the east and was steady at 20+ knots throughout the evening and night. We had the VHF radio on after dinner and heard the Canadian Navigator (remember that boat … the one that proceeded us down the Welland Canal?) trying to get into Toronto harbour via the East Gap. The waves were too big for them to maintain a course at 6 knots through the gap. 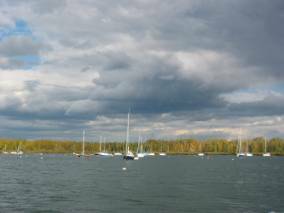 We think they ended up anchoring east of Toronto Island until the winds lightened on Thursday morning. It was very damp (heavy mist) and cold, so we had our furnace on for the first time since May. It worked VERY well. 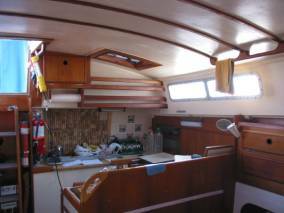 We are happy with it, although may add a bit more stainless steel over the chimney inside the boat. The ceiling was warm (but not hot). 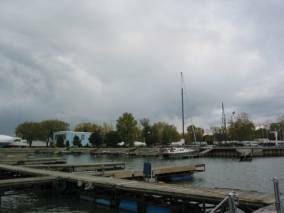 This morning the wind had diminished to “light and variable.” We left Mimico Cruising Club and did some trolling (there were not even markers on the fish finder and no luck on the line), then we sailed when the wind freshened to 6 knots from the south. We like this harbour. We tie to the wall at the mouth of the 12-Mile Creek. No fish Warf side at 12-Mile Creek. We had a fantastic sail from Bronte back to Toronto today. 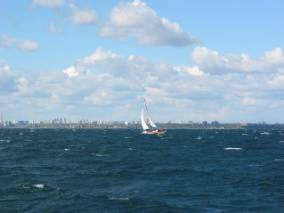 The wind was from the northwest, and built from 12 knots to 25 knots by the time we got to Toronto. We started off with a full main and full Genoa, took a reef in the main almost immediately, and finally ended up with the tiniest Genoa imaginable by the time we got to Toronto. Our maximum speed was 8.4 on the GPS and 9.4 on our speed log. We averaged over 6.5. Even though we were within 5 miles of the north shore of Lake Ontario, the waves built to 4 feet, and our windward decks and cockpit enclosure were dripping with spray from the waves. 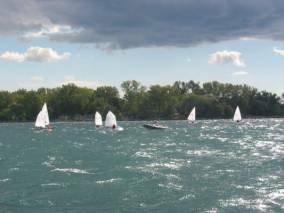 Lake Ontario in 20 kts Sailing on the Wild Side. 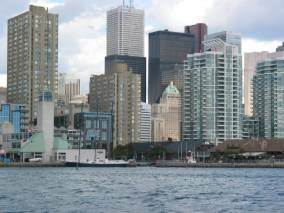 We lowered / furled sails just south of Ontario Place in the lee of the shore, and motored through the Western Gap into the Toronto Harbour. 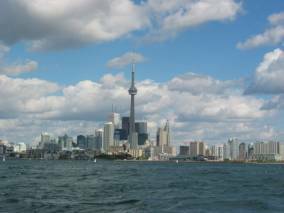 As soon as we passed the ferry to the Toronto Island Airport (known locally as the boat-killing ferry), we unfurled our Genoa and had a good sail through the harbour under Genoa alone. There were three races within the harbour. Bytes and Optimists were racing at the east end and having a challenging time with the winds that topped 20 knots even in the harbour. (At least there were no major waves for the little boats). We anchored in our favorite cove in the spit in 15 feet of water, the anchor bit hard and the boat has withstood gusts of 25 knots since we anchored. The moon is full tonight … just 28 days since we were in Mary Anne Cove in Baie Fine and saw the spectacular moonrise there. It is hard for us to imagine how much we have gone through in the last 4 weeks. It has been a good, but difficult time. 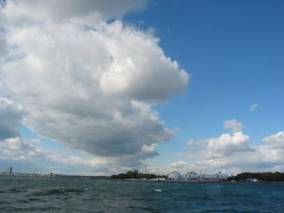 The northwest wind that gave us such a wonderful sail from Bronte to Toronto continued very strong Saturday and Sunday. Sunday was a lazy day of reading in the cockpit, with the diesel furnace keeping us warm until a huge downdraft filled the boat with diesel fumes (non-toxic, but not pleasant). A pair of swans became our “guardian” birds and a flock of Long-tailed Ducks (migrants that we have seen in the spring and fall in previous years) who spend the summer in Canada’s tundra. 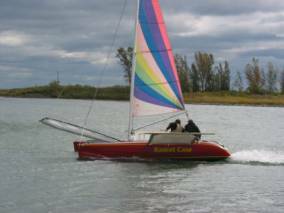 The commodore of the Aquatic Park Sailing Club (housed in the Leslie Street Spit) took a spin in his 25-foot catamaran in the bay, kicking up a small rooster tail when he turned to go on a broad reach in the 20+ knot winds. This morning the wind had diminished to 10-15 knots, so we decided to move further east. 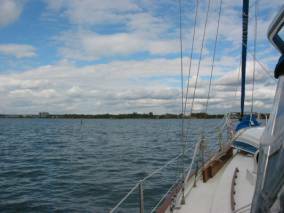 We had a good broadreach with wind varying from 5 to 18 knots from the West-Northwest. We decided to attempt heaving to, and were once again unsuccessful. When we got the sails and the wheel in the correct position, we were still moving forward at 3.5 knots (too much forward motion… we should have been going about 1.5 – 2 knots in the same direction as the wind.) 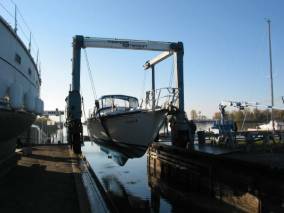 We have posted the question of how to heave to successfully to both the Whitby and Live-Aboard ListServes, and have received no responses yet, except use a sea-anchor instead of heaving to. The day was beautiful and sunny. 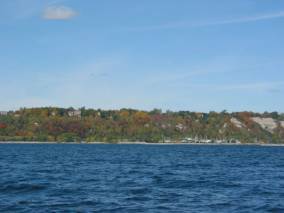 Just in the past few days, the foliage has turned yellow, golden brown, red and orange, and it was quite striking both at Toronto Island and along the bluffs as we neared Bluffers Park. 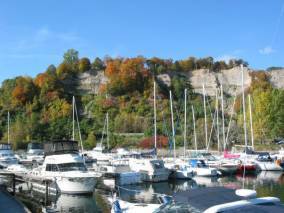 Once docked, we took a walk to the other yacht clubs in this complex (Bluffers Yacht Club, Highland Yacht Club, and Scarborough Bluffs Sailing Club, in addition to Cathedral Bluffs Yacht Club) and saw Puff (Brian’s first boat, the Flying Fifteen) that Doug Stevenson’s son is using. He has done an excellent job of polishing the hull and adding tensioners on the stays, and a fixed head stay. There are gale warnings for eastern Lake Ontario and 25-knot winds from the west for 6-foot seas in the western end, so we decided to stay put another day. It allows us to avoid making a decision about our next port for another day. The promised rain came after dinner last night. We were watching a movie (“Some Like It Hot”) and I noticed a person walking along the visitors dock in the rain. We were just a little alarmed, and poked our heads into the cockpit to see who was interested in the boat. Imagine our surprise when we came face to face with a raccoon. S/he was dripping wet and when we showed up, turned to go back to the clubhouse under the roof overhang. This is the second harbour in which we have encountered a raccoon. The other was the Bustard Islands. We took this layover day to review and update our to-do list (106 items on the list before we can leave to cross the Atlantic) and the shopping list that goes along with it. 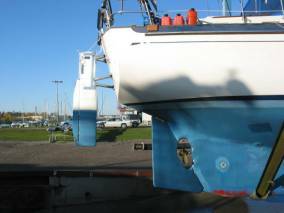 It includes some very simple items (replace the latch on the garbage bin) as well as the big items (inspect / replace standing rigging, chainplates, add insulation to the freezer, sand the bootstripe and epoxy the area before repainting). All in all, the list is a bit daunting. We then took care of two items on the list. We developed a new retrieval system for a person gone overboard accidentally. We have a Lifesling, which would be deployed, but getting a line snapped onto the Lifesling and the person hoisted onboard is still a challenge. 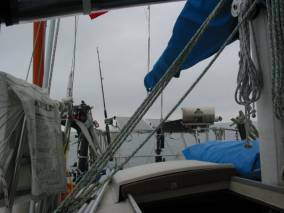 We are using or Vang hardware (from the mid-way down the main boom) with the old hoisting line and think it will work better than putting the old hoisting line on a halyard. We did not try it with someone in the water today (it has been below 60 degrees F all day), but we did put the line and the boom in retrieval position and we feel it should work. We also took the spinnaker pole halyard that was led to the cockpit back to the main mast and now have both main reef lines rigged as single line reefs to the cockpit. When we hoist the main tomorrow morning, we will find out if the lines are long enough and have been led properly. We will make sure we have much lake room for the hoist. 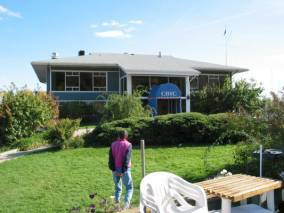 This morning we left Cathedral Bluffs Yacht Club. The wind was down to 5-10 knots from the northwest and it was sunny. There was a waterspout advisory for western Lake Ontario that did worry us a bit. Once we got out on the lake, the wind was 8-15 knots and we had a nice broad reach for about 1.5 hours and then we had to motor the rest of the way (19 nautical miles). 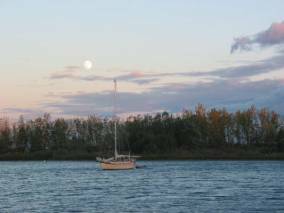 It was a pleasant last sail of the season. We did not encounter a waterspout. Yes, we have decided that the weather is a major concern. With Hurricane Wilma threatening Florida, we it will have some affect on our weather. Also, it is getting quite cold. It was 48 degrees F. in the aft cabin when we woke up. The lake is getting cold too, at 45 degrees F. We did not want to get caught on the south side of the lake, nor did we want to get caught in the west end with strong easterlies or in the east end with strong westerlies. 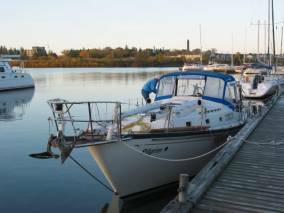 We will dock at the Whitby Yacht Club for a few days. We can see the docks of the Whitby Marina from here (don’t even have to go out into the big lake to get there) and will move later this weekend. We are still at the Whitby Yacht Club. The club boats are out of the water, so we are fairly lonely at the dock in just barely enough water to float us (we think there are 2-5 inches of water below our keel!). It is cold and raining with moderate winds from the northeast. We have stayed in the cabin all day with the heater on and layers and layers of clothing. Yesterday was sunny and we got a number of jobs done. 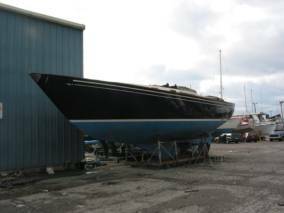 I cleaned as much of the topsides and waterline as I could reach in the dinghy. What a mess. The starboard topside smudges embarrassed me. One of the things Brian did yesterday was take measurement and do calculations to determine if our tachometer has been giving us accurate RPM readings from the engine. The tach takes its measurements from the alternator, and Brian upgraded our alternator last fall. He discovered that the pulley was 30% smaller, resulting in the tachometer reading 30% greater than the true RPMs. In short, when tachometer read 1800 in early July, we were actually only doing 1200 RPM. When we adjust our data for the "correct" RPM readings, there is little difference in prop performance between last year and this. We will still go ahead with our propeller trials on Wednesday and Thursday because we want to see what adding one more inch to the pitch on the Variprop will do for us, and we never did have loaded conditions for our fixed prop measurements. At least we have solved one big mystery from this summer. Last Wednesday we did the first of our propeller trials. We went out with a strong wind (15-18 knots) and 1/2 to 1 foot seas. 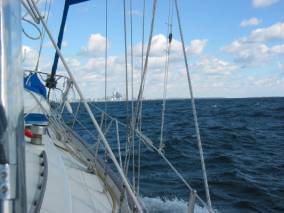 We did our trial down wind, up wind and abeam to the wind. The results (corrected for the revised RPM readings) show we are only .5 knot slower than the fixed prop. 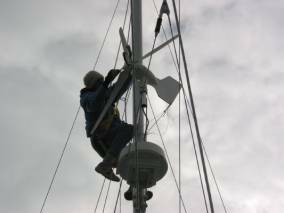 The fixed prop trial (done in 2002) was done when we had no sails, booms or masts on board, so we were MUCH lighter. We decided we did not need to rerun the trial on Thursday with the increased pitch in the feathering prop and the fixed prop, both that would have required us to be hauled out of the water. (We learned on Monday that the travelift operator was sick on Thursday, so we probably would not have been able to do the trial in any event). We also noticed that there is carbon smudging on the transom, indicating that we are probably slightly over-pitched right now. We will back off the pitch 1 inch (we had increased it two inches in Thunder Bay).